Online recipe content is the premier place where women discover new recipes as well as the number one driver for women to try new food products. 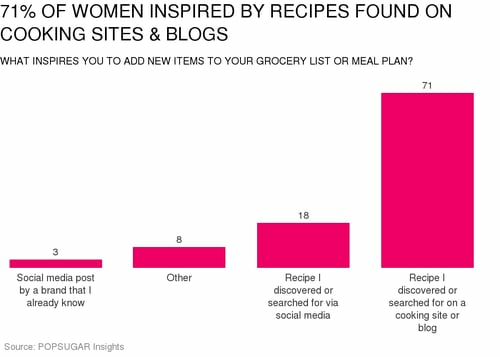 Seventy-one percent of women were inspired to try new food items because of a recipe that they searched for or found on a cooking site or blog. They are searching out new recipes to try during the week, with 30% doing so in the evening hours. Though women are finding inspiration to try new food items through cooking sites and blogs, they are not having as much success within the social media realm. Eighteen percent found inspiration via a recipe they searched for on social media, and only 3% found success through a social media post by a brand they already are familiar with. With 7 in 10 women being inspired to buy a new food product because of a recipe they found, consumer packaged goods marketers are given an immense opportunity. This is where native advertising plays a perfect role. CPG companies can work with publishing partners to create authentic and tasty recipe content that will inspire women to buy their products.